Dear Parents of White Children (Like Me), 2 | formations. // living at the intersections of self, social, spirit. Imagine with me for a moment, please. Let’s imagine you were living in a world in which there was an epidemic that threatened to abruptly and violently end the life of your son or daughter. It might happen when they were a child. It might happen when they were 32 years-old. But, everyday you woke up knowing that the moment they left the house, to engage in the most mundane of life activities—go to school, play in a park, drive to work, go to a party with friends—you had every reason to fear your child (or grown son or daughter) might never make it home. There was basically nothing you could do to protect them. Let’s imagine you lived in a world where you woke up everyday knowing your son or daughter was at risk of being killed by people who represent the state; the very people whose sworn duty it was to “protect and serve.” That month-after-month videos of the graphic murder of other people’s children—sons and daughters who happened to be just like your own—literally circulated for the whole word to see. And that you saw them, whether you wanted to or not. Murdered. In broad daylight. Caught on tape. Now, let’s imagine that you lived in a world where video proof didn’t even matter. So everyday you woke up and the list of names of other people’s children—children just like yours—grew longer and longer: the names of people whose murders were declared to mean nothing in in the eyes of the so-called ‘justice system’ we are all taught by teachers and pastors and grandparents (from young ages) to believe in. To trust. To hold in some sort of esteem. And the list of names of the killers who walked free—some even receiving a heroes welcome—grew longer too. Will you imagine all of this with me for a moment? That this is your child. Your son. Your daughter. I’m not asking you to do this to make you feel bad (or to feel worse). Honestly, feeling bad doesn’t accomplish much and I already know lots of us feel bad. I’m asking you to do this so we can ask ourselves these questions. If it was your child, how would you act? What would you do? Where would you throw in your lot? And with what amount of fierce, protective, daily fury? What does the determination of a parent look like? Someone willing to stop at nothing to try to protect their child? These are the questions I’m trying to answer for myself. And these are the question I’m longing to hear other parents of white children, like me, answer. I would talk about this crisis relentlessly. I would commit every spare financial resource I had (and more) to organizations leading the fight to end this evil epidemic. I would publicly declare my commitment to the value of my child’s life—and the lives of other people’s children just like them—every where I went. Even when it made me unpopular. No matter when it made others uncomfortable. And despite knowing that anger might end up coming my way. I would work to get every organization, work place or institution I was part of to publicly declare it’s resolute renouncement of this social evil, and throw it’s collective weight, reputation and resources into ending it. I would challenge and intervene in all actions, words and behaviors I encountered in day-to-day life that in any-way-shape-or-form contributed to a climate where apathy to an epidemic of sons and daughters being murdered and killers walking free became the norm. I would become a thorn in the side of any and all elected officials in my community, anyone with any power. I would make sure they knew who I was and what I wanted; a community where the life of my son or daughter wasn’t at risk every time they walked out the door. I would give my time, energy and skills (whatever they were) to organizations fighting this epidemic, so I was connected with others, and engaged daily and in measurable concrete ways in the fight to end this violence. I would never let my uncertainty about “what to do” stop me from trying to figure out ways to answer that question. I would not let my feeling of being overwhelmed by how massive the system is and the feeling of “what can one person do anyway” prevent me from acting anyway. I would educate myself about “what to do,” by connecting with others who were already doing it—who had long been doing it—learning from and joining forces with them to grow the power of a movement. I would never confuse a Facebook post or “like” with any of the above actions or presume it could substitute. I would read everything I could get my hands on to figure out how to try to save my child’s life. I would try to get others less in touch with the urgency of the epidemic to do the same. I would be brave, courageous and tireless. When I did get tired, I would keep going anyway. I would channel my grief and my terror into resilience and ferocity. Here’s a truth from my own life. So, I know beyond a shadow of a doubt, that when I imagine a world in which it was my children then the above list is just a start. A drop in the bucket of what I would do. Because there’s about nothing I wouldn’t do for my kids. This isn’t about feeling bad. A lot of us feel bad right now. You know what else it isn’t about? It isn’t about needing to imagine a white victim in order to actually care or be outraged. I know a lot of white people are not outraged and don’t care. But, I also know a lot of us are and do. But I also know this and this is what it’s about: it’s about realizing that most of us parenting white children (like me) would have turned up our game a long time ago, and in a heartbeat, it if were our children whose lives were on the line. So, that’s the question. What would you do if it were your kid whose life was literally on the line? Every time she or he walked out the door . . .
Whatever that thing is, those things are. Please do that. And please make sure I’m doing it too. ← Let’s Move Beyond Fear of the Words “White Supremacy,” and Say Yes to Racial Justice! Jennifer – your post reminds me of the climax in John Grisham’s novel and movie A Time to Kill, when the defense lawyer implores the jury to think of black girl who was raped and murdered as white rather than black. 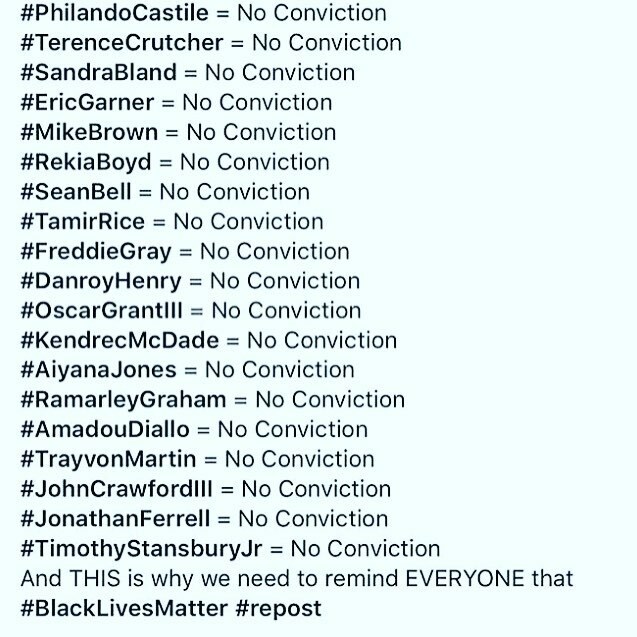 Only when we change our perspectives from white to black can we even begin to approach an understanding of the injustice and tragedy of these killings and those who were not convicted in their deaths.